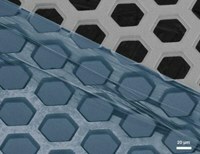 Carbon Nanomembranes (CNMs) are molecular thin, Carbon-based membranes, with wide application potential in many fields like electronics, energy, medicine and membrane technology. Due to their thinness of only about 1 nanometer and our ability to control the porosity, CNMs promise to enable energy-efficient separation based on molecular sieving and ballistic transport. The objective of the MOLFIL-CNM project was to develop CNM-based membranes and test them in practical applications. During the project, we demonstrated that at least one type of CNMs show a record high permeance of 10‑4 mol/m2*s*Pa for water, which is several orders of magnitude higher than conventional polymer membranes and some recently developed graphene, carbon nanotube and biomimetic membranes. Additionally, this high permeance is coupled with an excellent selectivity: Besides water, only Helium as the smallest gas pass through this type of CNM, and that already with a permeance of two orders of magnitude less than water vapour. The permeance of all other tested materials were beyond our detection limit. The project partners also evaluated concepts, how to implement the molecular thin CNM as active layer in thin film composite membranes, which can be handled in real-world applications. CNM Technologies has developed a concept for a batch-based pilot-production of CNMs with a capacity of several 10,000 m² per year at a price comparable to conventional asymmetrical membranes. As CNMs can be easily processed and scaled up, they open a path for highly selective and highly permeable water filtration. The use of CNMs for water filtration as well as newly developed ways of membrane production were protected by two patent applications.